by participating in one of the Academy’s public conferences or courses. When you register for any of our events you automatically gain a 2-year membership starting with the date of the conference/course you attended. Sign up for the ECA Individual Membership for one year (based on the calendar year – from January through December) and benefit from the following ECA membership advantages without necessarily attending a conference or a course. Or, even easier, you sign up for the new 3 years membership and benefit from the ECA membership advantages for the next three years. That way you won’t have to bother again next year – and you’ll save money. For more than 60 conferences and education courses a discount of 200.- EUR will be granted. For GMP Webinars the discount is 25% off the regular fee. In addition, publications and the ECA Good Practice Guides are available for a 35% discount. 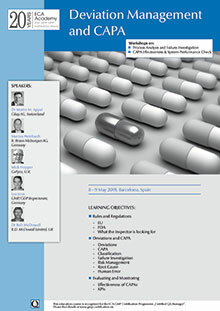 Free access to the ECA Guideline Manager – a database comprising more than 1.100 GMP guidelines. This online database is updated every month and can be sorted in two tree views, either by topics or by issuing authorities. Additional free ECA Academy Documents like Guideline Analyses, Compliance Checklists, SOPs etc. With the ECA WebApp for your smartphone or tablet you have GMP information at hand. Anytime. Anywhere. Free of charge. And in addition to news, guidelines, courses and conferences and a comfortable search function available to everybody you as a member also have access to the password-protected complete GMP Guideline Manager database – including the two guideline tree views (sorted by topics or by issuing authority) also available in the Members’ Area. As a member you also benefit from special discount offers that have been negotiated e.g. with Publishing companies (e.g. Books, Journals). 5) GMP Certification: By completing the GMP Certification Programme participants receive an internationally acknowledged certificate. >> Benefit from the ECA Membership advantages for 3 years (2017 through 2019) and pay only EUR 513,- instead of EUR 570,-. In addition to individual memberships, the ECA Academy also offers a discounted rate. Please contact us if you want to apply for this discounted rate at heimes@gmp-compliance.org. You and all your colleagues in the country the group rate was signed up for will automatically be able to take advantage of all ECA membership benefits.